Stoops are the prefect way to have a good curb appeal, enhancing your main entrance and home value, even when you don’t realize how important they can be, the concurrent impression we tend to have of something is always the first impression which happens to be your home main entrance. Our services include home / residential as well as office space buildouts, office space renovations, hotel construction, commercial and residential contracting and construction projects. We are licensed and insured New York office, hotel, and retail building contractors. 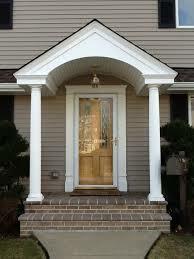 By adding a portico you can change the architectural design of your home and make it look as a totally brand new home, it keeps you safe from the rain or snow while you look for your keys, as well has enhancing the appearance, you could get a professionally designed entrance, you won’t even recognize your own home once we start remodeling. We have more than two decades on the industry, our group of experts and specialist on different areas of the construction industry will exceed your expectations, we assure our work and your satisfaction is guarantee. In addition to these contracting services we provide services such as roofing repair for residential and commercial.